The SKGLK keyed deadbolt for storm and screen doors complements the appearance of GL Series lever handles while adding additional security to your home. FUNCTIONALITY A keyed deadbolt allows you keep your main door open and enjoy the light that comes in through a storm door while still feeling secure. The SKGLK is not a high security lock, but a secondary level of security. The key allows you to lock your storm door as you leave the home, and unlock it if someone inside has locked the door. INSTALLATION Installation is easy and should take about 20 minutes. Only three small 5/16 in. holes are required to be drilled through the door for the screws and spindle (many of our competitors' locks require larger 7/8 in. holes). Only a tape measure, drill and screw driver are required. A center punch to mark the holes is handy, but not required. The set includes screws for doors 1 in. to 2-1/8 in. thick. The spindle can be cut to the length required. The SKLGK is designed for out-swinging storm doors. You may be able to use it on an in-swinging storm door, but we can't provide instructions for doing so and you may need to get creative. 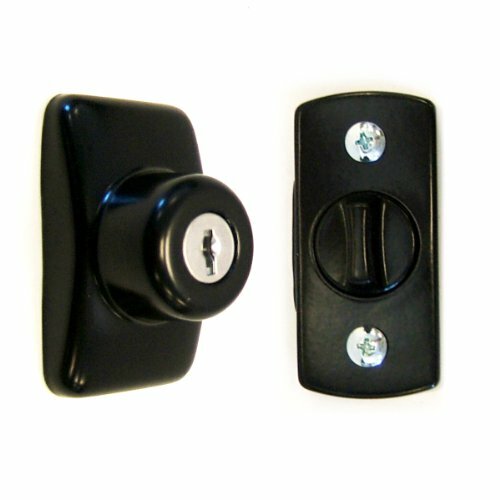 MORE If you have a DX Series pull or push-button handle, you may want to consider the DX Series deadbolt (model # SK703). The set is manufactured from die cast zinc and painted or coated to match the colour of the handles. Ideal Security has been supplying quality storm and screen door hardware to door manufacturers for over 50 years.